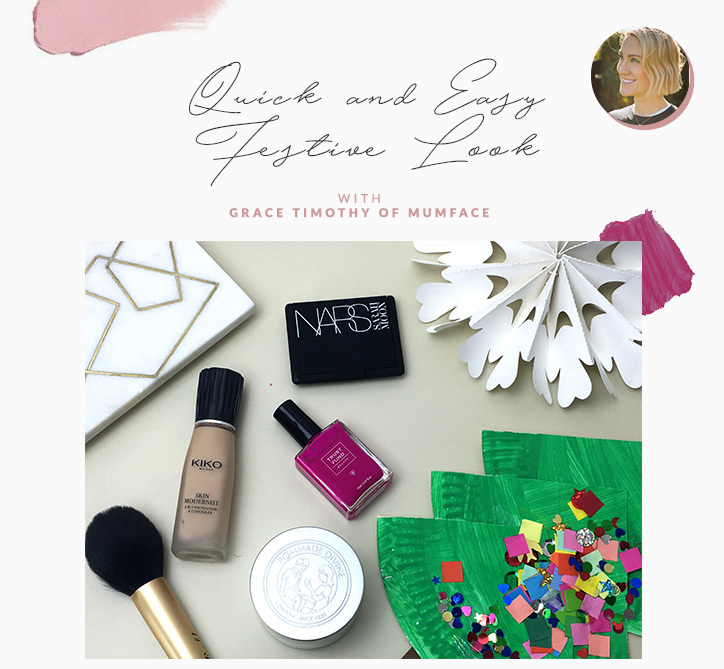 Grace Timothy is a lifestyle and beauty writer and mama to four-year-old Noémie Rae. She lives with her husband and daughter in Sussex and loves soft play. Just kidding – she hates it and will continue to do so until they serve a proper gin and tonic there. You can find her beauty tips on Mum Face and fuss-free tutorials on her Youtube channel – including the festive eyes and lips video. It’s that time again. 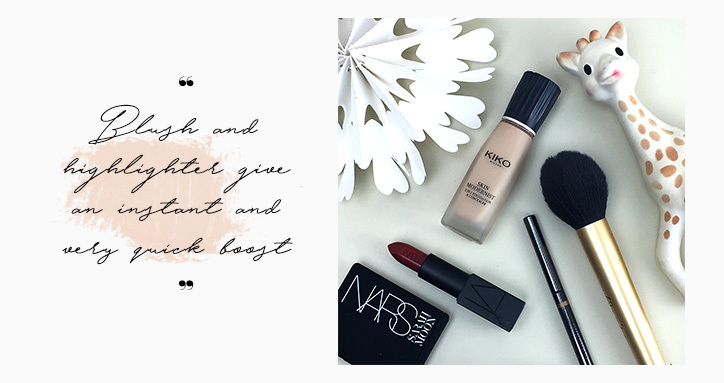 When the late nights, stained clothes and sheer exhaustion aren’t down to your kid alone – it’s party season. Whether you’ve got an office party this Christmas, a night out with friends or just the regular rota of family get-togethers, it’s a great excuse to update the makeup bag with some choice Christmas gifts to yourself. But rather than trying to cram a 50-minute getting-ready routine into what is realistically more like a 5-minute window (thanks, Hey Duggee), here’s how to keep it short and sweet, tackling the classic hallmarks of a ‘mumface’ and getting your Christmas spirit ON. If you have time, I am a big advocate of the sheet mask. Cleanse the day away with something juicy that leaves a softness behind (for me, it’s always Emma Hardie Amazing Face Moringa Cleansing Balm), then pop a sheet mask on while you do something else – coralle the kids into brushing their teeth, get them into the bath… Even if you only manage 5 minutes, the serum will have suitably plumped and hydrated your skin, so your makeup will glide on. Plus if it’s an Animalz Sheet Mask (£3.99 for a packet) with a Tiger face print, your kids will LOVE it. And there’s no need to rinse, so really you’re saving time, right?! I am currently battling The Red Beard of Winter (dry, red patches around my mouth and chin) – those of you who have sensitive skin or are pregnant may well know the score! So like a lot of women during the colder months I’m after a stronger coverage – Kiko Skin Modernist, a brilliant concealer-foundation hybrid. That’s two steps in one product, so still speeding along! I concentrate a little more beneath the eyes and across the lid so it will also anchor my makeup. But go lightly there: too much and you’ll get a line of product pooling in the crease. Blush and highlighter give an instant boost when I’m feeling grey and tired – I like Mac’s Spellbinder Powder Blush and Hourglass Strobe Lighting Powder in Ambient brushed over cheekbones, jawline and brow bones for a flash of light. Basically to fake the dewy glow of youth. It works, trust me. I’ve always been bad at drinking enough water, but isn’t it about 10 times harder once you’re a mum? Add to that the probable sleep deprivation, and you may find your eyes are showing it all up front with fine lines and crinkly bits. I use a moisturiser right up to the eyes, and occasionally a bit of eye cream. I’m not under the illusion that anything topical will banish lines forever, but more because it’s refreshing after a long day, and keeping the skin dewy knocks out the appearance of most lines anyway. Then, the eye routine has to be super quick, to fit into the time it takes for my husband to read our daughter a story usually before my mum arrives to babysit. I like lots of light, shimmering textures for party eyes, all punctuated with a good black liner. Not only are light-reflecting shades more forgiving of a speedy hand and require less precision (you can whack them on with your fingers) but they also widen and wake up the eyes. I like a wash of Bobbi Brown’s Eye Shadow in Champagne Quartz over the lid, plus a little beneath the lash line. I then add a bit of definition with Bobbi Brown Sparkle Eye Shadow in Smoky Quartz, just in the socket line and along the lashline, both top and bottom. This Christmas I’m finishing with a pop of the new NARS Dual Intensity Eyeshadow in Antares, just dabbed onto the centre of the lid and the inner corners for a flash of shimmering light. This is such a beautiful shadow, you can either wear a sheer wash of it during the day or build it for an almost glossy finish, so it’s definitely one that works way into the New Year. I finish with NARS Moon Kohl liner in Witching Hour along the upper lashline and waterline. It’s so soft it takes seconds to apply, and you can always tidy with a moistened cotton bud if you make any mistakes. 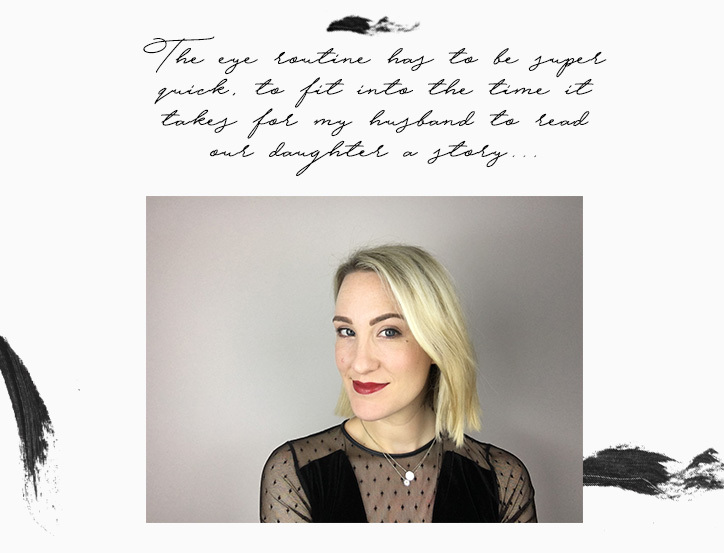 Add lashings of mascara – my favourite is L’Oreal False Lash Telescopic. A strong brow will also add structure – I have an HD Brows treatment every 6 weeks which saves me time, and simply fill in any gaps with Benefit Precisely, My Brow Pencil, drawing light, hair-like strokes in the direction the hair grows. And that’s it – all done in under 5 minutes! Gone are the days of liners, primer and powdering my pout to make it last. I’m most likely chucking it on in the taxi or using the microwave as a mirror while my daughter finishes supper! I jump straight in, apply my lipstick straight from the bullet. 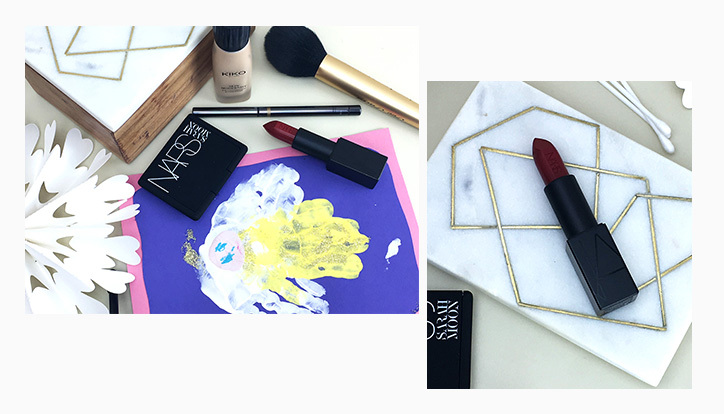 This season I like the 90s throwback of a brown matte lipstick – my favourite for its wearability is NARS x Sarah Moon Lipstick in Indecent Proposal – but then I can’t resist a slick of NARS’ Velvet Lip Glide (shade NO.54) for a very sophisticated twist on a party lip.